Our flight to Xi'an was about two hours followed by a 30 to 45-minute bus ride from the airport to the hotel. By the time we arrived at the hotel we were all pretty beat from the long day. It was after midnight and we had an early date the next morning to visit Emperor Qin's tomb and see the wonderful 8,000+ strong Terracotta army that he assembled over two thousand years ago. Anne and I, having seen an exhibit of what the tomb was like in Singapore a number of years before, were very anxious to now have the change to view the real thing. Chinese civilization has its roots in Shaanxi and Henan provinces where the Huang He, or Yellow River, winds its way through its fertile valleys. The Han Chinese settled this area in the 3rd century BC. Xi'an, the capital of Shaanxi Province, lies just a few miles to the west of where the Wei and Huang He converge. From Xi'an the China we know today would be formed thanks to China's first emperor, Qin Shi Huangdi. 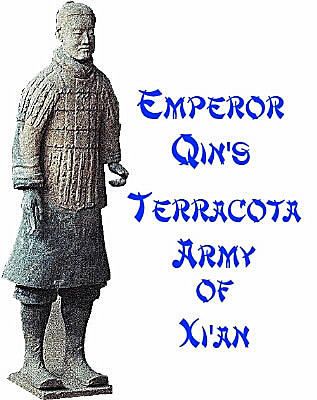 It was Emperor Qin who unified all of the warring clans into a unified nation. Emperor Qin's tomb lies about 20 miles east of the city and is a vast and wonderful treasure to visit and explore. 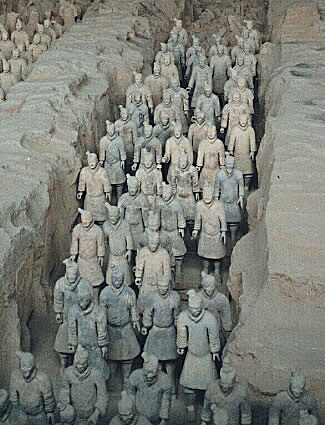 Peasants accidentally discovered the tomb's terracotta army in 1974 while digging a well. Today modern buildings cover the unearthed treasures and provide a protected environment for them. 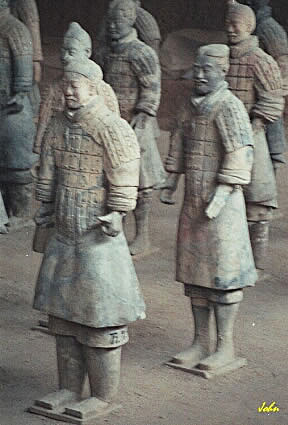 Qin's terracotta army consists of life-size figures of warriors, depicted in battle dress according to rank an unit, and numerous figures of horses and chariots, and this is only part of what is believed to be his grand tomb. 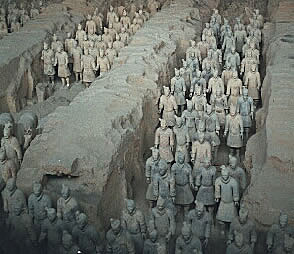 The terracota army lies approximately a mile east of Qin's main tomb which is said to contain spectacular objects. To date only trial digs of the main tomb site have been completed and they have yet to find the main entrance to the tomb. Anyone wanting a good idea of Emperor Qin's life should rent a copy of The Emperor and The Assassin. It's a long movie, 2 hours and 41 minutes, with English subtitles, so it's not easy to follow at times, but it presents a fairly accurate history of Qin's efforts and struggles to unite China. To date three underground pits, totaling 22,000 square meters, have been discovered with 8,000 life-size terracotta figures of warriors and horses. 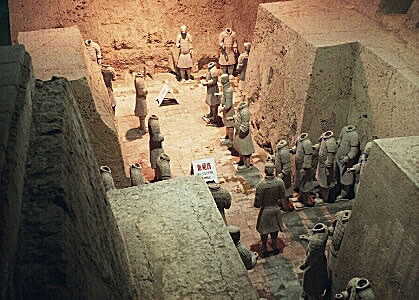 Each pit lies 15 to 20 feet below current ground level and was constructed with the figures placed in corridors or rooms. These corridors, separated by earthen walls, are paved with pottery bricks on which the warriors and horses stand. Large wooden planks placed over the corridors between the earthen walls and covered by layers of mats made from fibers formed the roofing. This was then covered by earth to conceal the the army's location. 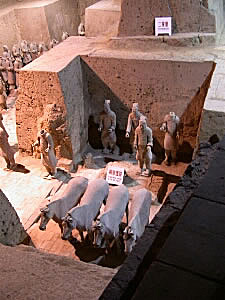 In the 2,000 years since its construction the roofing collapsed damaging the figures and there is evidence of fires indicating the presence of tomb robbers also. 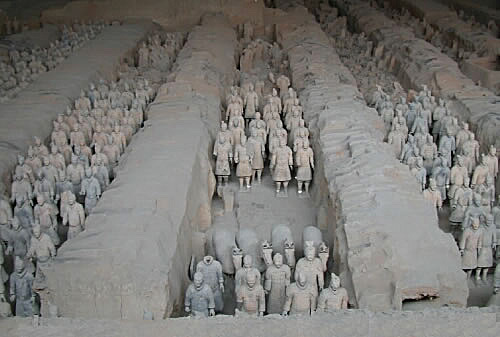 In Pit 1 the terracotta warriors are arranged in typical battle formation. Officers and soldiers of various ranks stand in 11 columns with others in horse drawn chariots. dormant and covered by the earth. 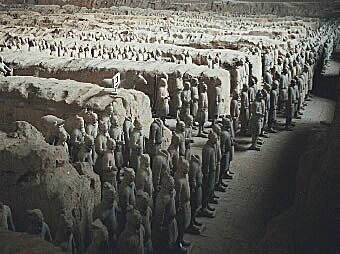 Pit 1 is estimated to contain about 6,000 terracotta warriors. and fired separately which accounts for the large hole appearing at the neck. Construction of the terracotta warriors is interesting and, considering they're over 2,000 years old, very high-tech for the period. 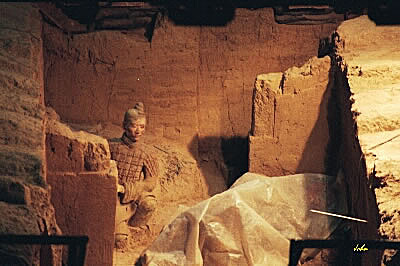 Prior to Emperor Qin Chinese pottery was relatively small and fired at low temperatures. Studies of these life-size pottery figures, weighing between 242 and 660 pounds, indicate they were fired at much higher temperatures, between 950 and 1,050 degrees centigrade, resulting in a much harder pottery figures. Constructed from local clay all of the figures were constructed essentially using the same methods. The head, arms and bodies of the soldiers are all hollow with the legs being solid pottery. The same is true of the horses, their head and body are hollow with solid legs. Archaeologist believe that separate molds were used to make the various body parts, with these parts being glued together prior to firing the pottery. The human heads were made from a two-piece mold that were joined together later on. The ears, nose, hair and other facial features were individually sculpted and added prior to firing. In addition to the facial features the armor, belt hooks, shoe ties and costume details were also independently sculpted. As a result each warrior has a different and unique appearance, no two are exactly the same. The names of the craftsmen creating each figure was inscribed on the warrior's robe, leg or armor. Similar practices were also employed for sculpting the horses making them unique also. Looking at the great attention to detail that these artisans had, It's evident that they took great pride in their work. 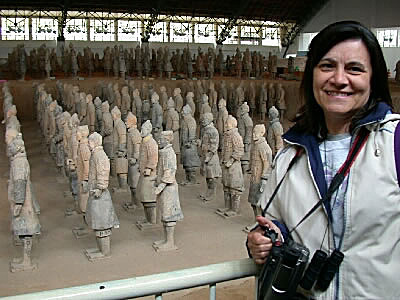 We are indeed fortunate today to be able to stand before Emperor Qin's mighty army and behold its beauty.